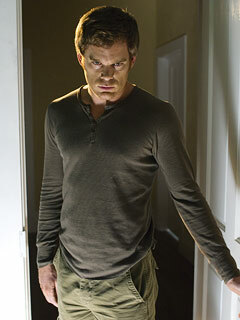 Dexter will screen on TEN from Sunday July 6. The Free to Air premiere will screen at 9:40pm, replacing the final 4 eps of the Supernatural season. By screening after 9:30pm, TEN is able to screen the series in all its gory glory, it only needs appropriate classification warnings. There was never really any doubt that TEN would need to censor the series. It was CBS that had to chop the thriller, made by Showtime, but Australian broadcasting regulations are far more liberal than those of middle America. By screening the show on a Sunday, TEN is no doubt looking to promote its other shows for the week. Two series have aired in their entirety on the Showcase channel already, with outstanding word of mouth for the show and its star Michael C. Hall. A third series will launch in the US fall later this year. I agree Sundays is probably the best time for Dexter, but I guess it pushes back other things on Sunday like the F1.